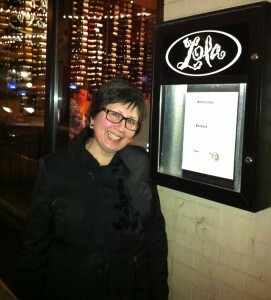 On Friday 11/11/11 Yianni and I met some friends for dinner at Michael Symon’s Lola Bistro in downtown Cleveland. Iron Chef Michael Symon is Greek and Sicilian. His show, “Cook Like an Iron Chef “, is on the Food Network Cooking Channel. I did spot him that evening and when he smiled at me I felt like a certified food groupie! Our experience was nothing short of fabulous. Yianni managed to snap quite a few photos with his iPhone, so I will share them with you here with as much description as I can. 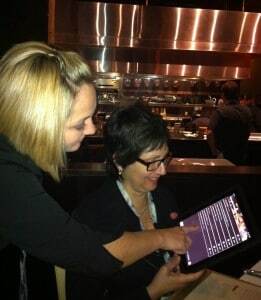 The waitress brought over an iPad for us to use to select our drinks. I ordered a Samuel Smith organic pale ale and Yianni ordered a single malt scotch. Later, Yianni switched to wine. 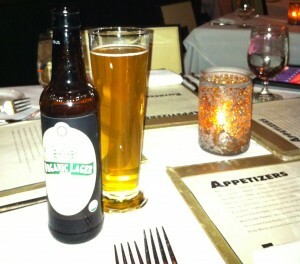 I continued with the pale ale that was, according to the menu, selected by their sommelier. Yianni had an Apple & Goat Cheese salad with beets, walnut, bourbon and mizuna. Mizuna is the deep green and saw-toothed leaf you see on the plate. 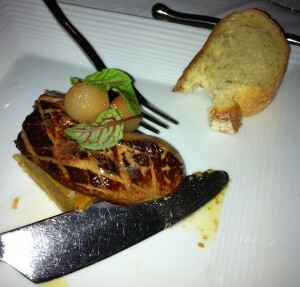 I ordered the Fois Gras which was served atop pumpkin pie with pickled apples and ice wine vinegar. This might be the best appetizer I’ve had yet. Yianni ordered Wild Salmon with salsify, beets, spinach and dill for his entree. Salsify is a root vegetable. 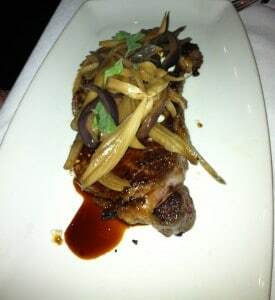 I had the Rib Eye steak with smoked onion, blue cheese and oregano. It was excellent. 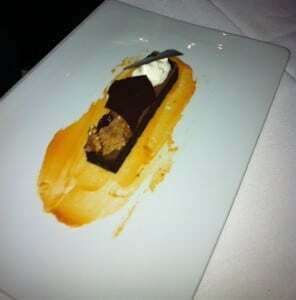 For dessert I ordered the Dark Chocolate Creme Cake with walnut, dried cherry and sweet potato. Again, delicious. 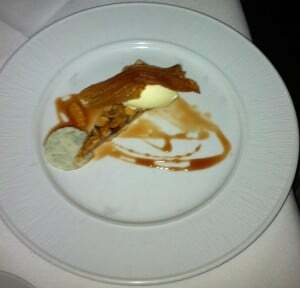 Here is their Honey Nut Tart with almond & orange ice cream, blue cheese and port caramel. We finished with cappuccino. Dinner at Lola’s was a great experience. If you are headed toward Cleveland, call ahead, make a reservation and thoroughly enjoy yourself. Hey Katherine, this is really nicely done. It was a very memorable evening, the company and food was top notch. We loved having dinner with you and Karen! See you soon! Previous Previous post: Mom! Meatloaf now!